Dear friends, as the high season is coming to an end, I would like to share with you some exciting news and experiences that I have enjoyed as of late. Two journeys to explore, enjoy and reaffirm the major roots of Kallpa: a 4 days trekking towards Patagonia Ice Field from El Chalten; and another 4 days trekking in Salta to launch our new Trekking to the Clouds product. The good thing about being in the travel business is that from time to time we have the chance to develop new experiences. And in doing so we are actually enjoying those experiences. The Trekking to the Clouds in Salta is becoming a great development –it is done in collaboration with Kallpa and two other Salta-based companies. And we are quite excited about introducing this into the market together. But first I would like to share with you my recent experience in El Chalten. Back in March I went to El Chalten. Partly on holidays, and partly to make a balance of our operation in Chalten. For the past season we started having our own local operation in Chalten. And it was a great experience which we are planning to continue for the next seasons as well. Being a local in such a destination makes a great difference to us. It gives us the chance to better attend to customers in a village that is one of the most beautiful gems of Patagonia. Now about the holiday part of the trip, I did enjoy a 4 day trek known as “Vuelta al Cerro Huemul” (Huemul Circuit) with a few colleagues from Kallpa. It was truly exciting. A bit demanding, but doable.For two out four days we had great views of the Southern Patagonia Ice Field (the second largest contiguous extra polar ice field, after Greenland). It is hard to share in writing the experience of walking the glaciers (and on them in some parts of the trail! ), gaining altitude along the way, and then taking a look back to see in the distance below- the glaciers you have just been walking on earlier. The wind blowing in Paso del Viento (wind pass), the climate constantly changing from a sunny day to a soft snowfall once in the Ice Field side, going to Refugio del Viento, and then sunny again. The immensity of the landscape and how small it makes you feel. Well… this is a new one. About a year ago we started working together in partnership with Argentina Trails and Socompa developing this trekking. Our goal was to have a regular trekking running in Salta at competitive costs. The landscape and the history around us in the northern region of Argentina deserves such a product. We are happy to announce that we made a huge progress and are now just about to launch it (you still have to wait a few more weeks to officially share the news). A few weeks ago we went with a group to experience this trekking and I would like to share with you that adventure. 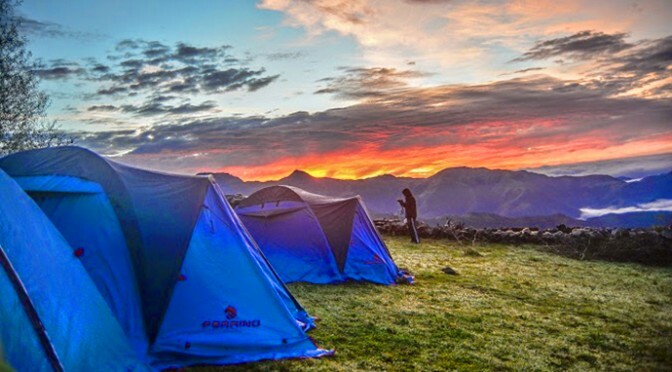 This trekking takes place at an altitude range of 2300-3400 mts high.The views are spectacular. During most of the journey you are above the clouds level. You start climbing up El Golgota hill and after a 45 km walk you finish right in Salta city (you actually walk down into the city, in the San Lorenzo district). Besides the magnificent views and landscapes, one of the highlights of this adventure is sharing some time with the few inhabitants of the region (that still breed cattle and sheep in a quite peculiar environment). We camped in their backyards for two of the three nights we spent there, had dinner enjoying their company and had the chance to talk and have fun all together. It was a great experience and we all felt rewarded afterward by the warm and pleasant time spent together. Another major highlight is that the journey goes along the ancient Inca Trail and through the ruins of this empire when the Incas dominated the region centuries ago. In fact, our first campsite is right next to “Sillon del Inca” (Inca Chair), a place that is considered to have been a tax collecting point in the empire. So, this has been a fun time for me, and I just wanted to share it with you. I hope you can also enjoy these experiences in the near future. I’m sure that down the line, you will be hearing again about the Trekking to the Clouds. And also about new more products by Kallpa.